What do you know of Mexico’s struggle for religious freedom? Have you ever been told about the Cristero War? Would you be surprised to learn that Margaret Sanger, founder of Planned Parenthood, supported this war against people of faith? Here in the U.S., many people of faith are asking: “What is the price of religious liberty?” During the 1920s, people of faith in Mexico knew the answer: Life itself. 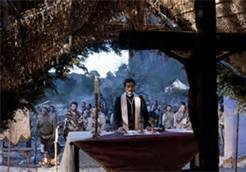 I had never heard about the Cristero War until the movie “For Greater Glory” was released in 2012. I purchased the DVD and companion book by Ruben Quezada (Ignatius Press) as gifts for my husband. We have shown this epic film three times to family members and plan to show it again… and again. How fitting that this movie made its debut the same year that our federally mandated health care made its. Please. Rent or, better yet, purchase this DVD. Host a movie night and invite your Bible study, youth, or parent group. Hear young people raise their voices as one, proclaiming: “Viva Crista Rey!” (“Long live Christ the King!”) Understand that what happened in Mexico was an aggressive war on the Catholic Church which resulted in the death of 200,000 people of faith. But, recognize that what is happening here in the U.S. is an insidious and, thus, potentially more devastating assault on those who seek to follow the Lord and Savior Jesus Christ rather than man. Mexico was the original cradle of Christianity in the New World. Missionaries were dispatched from Mexico to North and South America. Yet, this deeply Catholic country was repressed by an atheist-socialist regime. Following the revolution in 1917, the government vowed to free the people from “fanaticism and prejudices.” President Calles, clever with his language, spoke of defending “Mexican dignity” against “foreign intruders” (the Holy Roman Catholic Church). Public displays of faith were outlawed. Churches, seminaries and convents were desecrated. Catholic schools and newspapers were shut down. Priests were tortured and killed, many shot while celebrating Mass. But, so were fathers, mothers, grandparents, and young people. Cristiada, the name given to the Cristero movement, was a response to the direct attack on the Catholic faith by the Mexican president and his “Calles Law.” The Cristiada movement was organized by the National League for the Defense of Religious Liberty. (Does this name bring to mind our own Alliance Defending Freedom or Becket Fund for Religious Freedom?) Initially, the League advocated peaceful resistance to the Calles Law in the form of boycotting taxes and nonessential goods. Petitions were signed, but refused by the Mexican Congress. It soon became evident that Catholics would have to fight back or surrender their religious freedom. The Cristero War was costly. Relative peace may have come after the bloody years between 1926 and 1929, but practice of the Catholic faith in a predominately Catholic country has never been the same. Sanger was a devout advocate of eugenics and a society of the “most desireable.” She worked tirelessly to promote birth control, most curiously in Hispanic and African American communities. We should not be deceived. Birth control has its roots in the eugenic movement. Sanger, the mother of eleven living children, was a believer in eugenics or a “race of thoroughbreds.” Her original organization, the American Birth Control League, was quickly renamed Planned Parenthood Federation of America. Birth control may be masked as a “woman’s reproductive freedom,” but can you tell me why advocates of eugenics would join forces with those promoting birth control? President Obama and Secretary of State Hillary Clinton remind us that we, in the U.S., enjoy “freedom of worship.” But, this is deception. It is a redefinition. This is not what was guaranteed in the Bill of Rights. Correctly stated, American citizens enjoy “freedom of religion.” Freedom of religion means more than just being able to “go to church.” It means being able to speak and live the faith; to set up schools, hospitals, and agencies of servanthood in the name of Jesus Christ. Oh fellow frogs in the boiling pot! Know your history! Learn from our neighboring people of faith in Mexico while we have opportunity. Resist evil. Guard liberty. Teach the faith. I recently saw this movie on netflix…It was outstanding! Thanks for reminding me. Thank you for sharing this story. My great grandparents emigrated to California during the Cristero War. It’s quite an amazing story. A mother, with 5 children, take a train from Durango to El Paso. They arrived in El Paso 2 week’s before Jose Sanchez de Rio was persecuted at the age of 15. Thank you, Jeffrey Garcia, for sharing this about your great grandparents. Such a frightening period of time for so many parents and children. The persecution was real… and you are one of those people who can help explain why. May we learn from history and not repeat sins of the past.